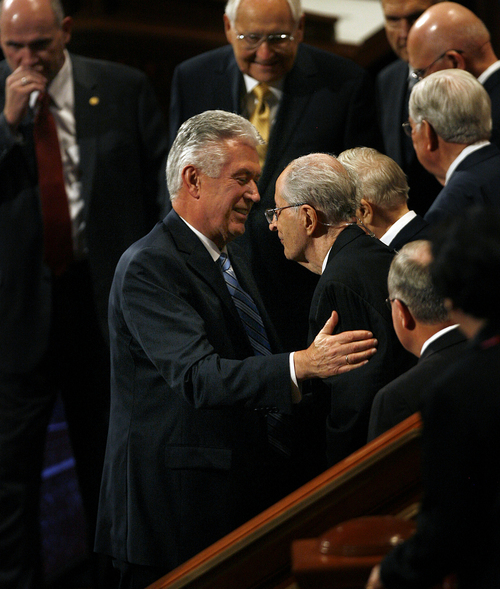 General Conference • LDS apostle Uchtdorf says church leaders have made mistakes. Scott Sommerdorf | The Salt Lake Tribune President Dieter F. Uchtdorf speaks during the 183rd LDS General Conference, Saturday, October 5, 2013. Scott Sommerdorf | The Salt Lake Tribune Members of the church provide sustaining votes for the retention of President Thomas S. Monson and the other members of the Quorum of the Twelve during the afternoon session of the 183rd LDS General Conference, Saturday, October 5, 2013. Scott Sommerdorf | The Salt Lake Tribune Sister Carole M. Stephens of the Relief Society General Presidency speaks about the various aspects of the holding of the priesthood during the 183rd LDS General Conference, Saturday, October 5, 2013. Scott Sommerdorf | The Salt Lake Tribune President Dieter F. Uchtdorf, left, visits with Elder Robert D. Hales of the Quorum of the Twelve Apostles as they leave the morning session of the 183rd LDS General Conference, Saturday, October 5, 2013. 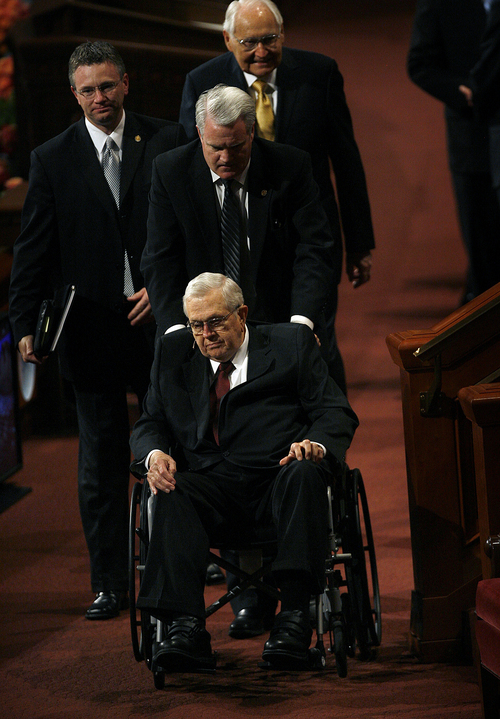 Scott Sommerdorf | The Salt Lake Tribune President Boyd K. Packer is helped as he leaves the afternoon session of the 183rd LDS General Conference in his wheelchair, Saturday, October 5, 2013. 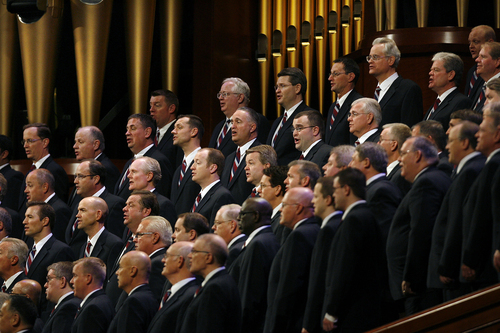 Scott Sommerdorf | The Salt Lake Tribune The Mormon Tabernacle Choir sings during the 183rd LDS General Conference, Saturday, October 5, 2013. Scott Sommerdorf | The Salt Lake Tribune Sister Carole M. Stephens of the Relief Society General Presidency speaks about the various aspects of the holding of the priesthood during the 183rd LDS General Conference, Saturday, October 5, 2013. Scott Sommerdorf | The Salt Lake Tribune Elder L. Tom Perry leaves the morning session of the 183rd LDS General Conference, Saturday, October 5, 2013. Scott Sommerdorf | The Salt Lake Tribune LDS President Thomas S. Monson and other members of the Quorum of the Twelve Apostles visit with each other as they leave the morning session of the 183rd LDS General Conference, Saturday, October 5, 2013. Scott Sommerdorf | The Salt Lake Tribune LDS President Thomas S. Monson and other members of the Quorum of the Twelve Apostles visit with each other as they leave the morning session of the 183rd LDS General Conference, Saturday, October 5, 2013. Scott Sommerdorf | The Salt Lake Tribune Elder Quentin L. Cook and his wife Mary leave the morning session of the 183rd LDS General Conference, Saturday, October 5, 2013. 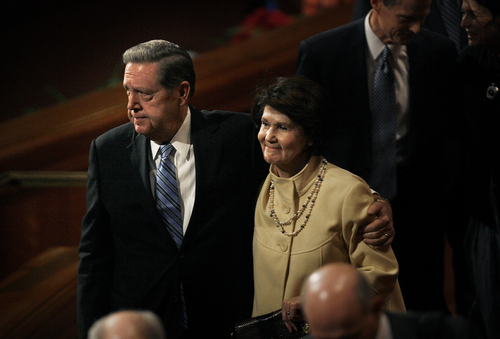 Scott Sommerdorf | The Salt Lake Tribune Elder Jeffrey R. Holland and his wife Patricia leave the morning session of the 183rd LDS General Conference, Saturday, October 5, 2013. 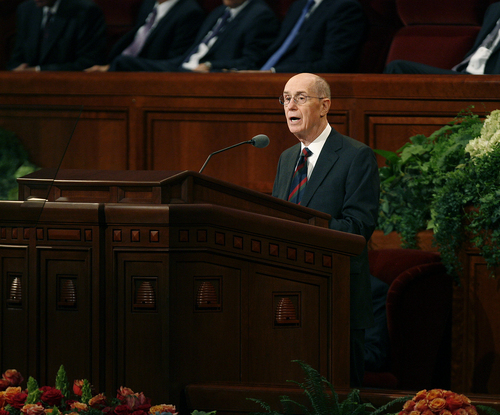 Scott Sommerdorf | The Salt Lake Tribune President Henry B. Eyring opens the morning session of the 183rd LDS General Conference, Saturday, October 5, 2013. 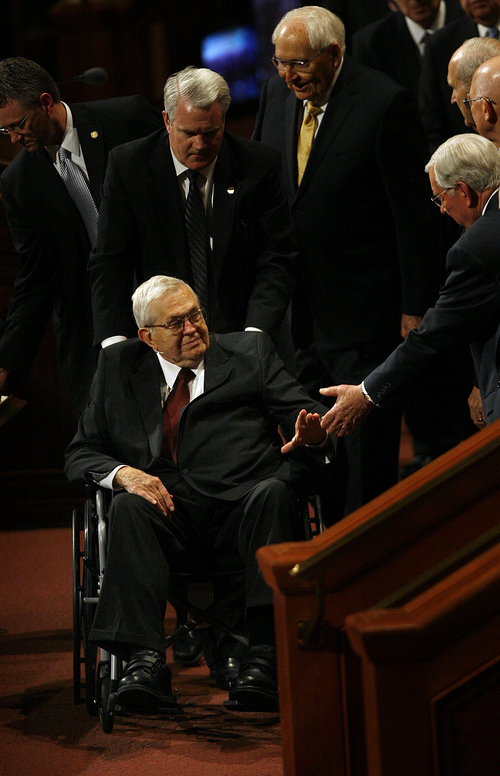 Scott Sommerdorf | The Salt Lake Tribune President Boyd K. Packer is helped as he leaves the afternoon session of the 183rd LDS General Conference in his wheelchair, Saturday, October 5, 2013. 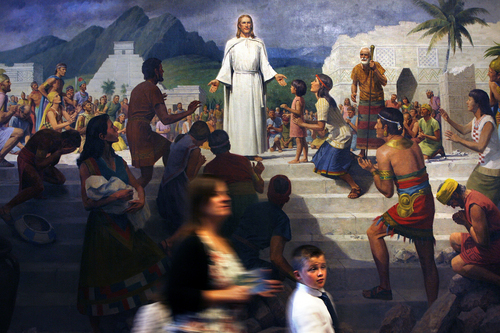 Scott Sommerdorf | The Salt Lake Tribune Conference-goers blur past the painting "Christ Visits the Americas (3 Nephi 11:8)" as they go to their seats for the afternoon session of the 183rd LDS General Conference, Saturday, October 5, 2013. 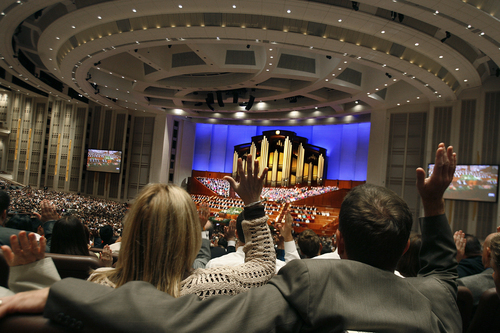 It is wrong to assume that Mormons who leave the faith "have been offended or lazy or sinful," a top leader told members Saturday during the LDS Church&apos;s 183rd Semiannual General Conference. "It is not that simple," said Dieter F. Uchtdorf, second counselor in the LDS Church&apos;s governing First Presidency. Some struggle with "unanswered questions about things that have been done or said in the past," Uchtdorf explained. "We openly acknowledge that in nearly 200 years of church history  along with an uninterrupted line of inspired, honorable and divine events  there have been some things said and done that could cause people to question." "To be perfectly frank," Uchtdorf said, "there have been times when members or leaders in the church have simply made mistakes. There may have been things said or done that were not in harmony with our values, principles or doctrine." God is perfect and his doctrine is pure, he said, but human beings  including LDS leaders  are not. LDS Church President Thomas S. Monson opened the conference by announcing that global Mormon membership has reached 15 million. 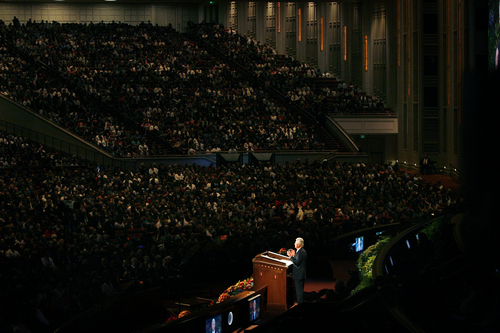 Speaking from the Conference Center in downtown Salt Lake City before 20,000 Mormons and to millions more worldwide via telecasts and the Internet, Monson also reported that the number of LDS missionaries has skyrocketed  in the year since he announced lower ages for missionary service  from 58,500 then to 80,333 today. That&apos;s a 37 percent jump. "Now is the time for members and missionaries to come together, to work together, to labor in the Lord&apos;s vineyard to bring souls unto him," said the 86-year-old leader. "He has prepared the means for us to share the gospel in a multitude of ways, and he will assist us in our labors if we will act in faith to fulfill his work." 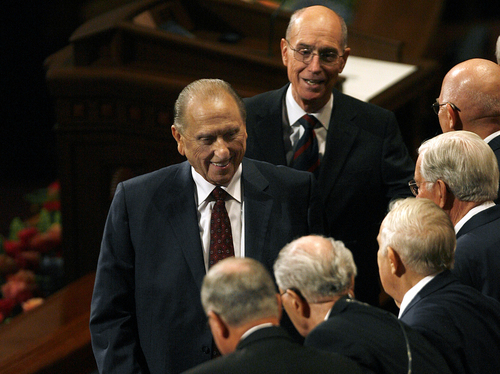 Monson, considered a "prophet, seer and revelator" by members of the Utah-based Church of Jesus Christ of Latter-day Saints, also noted his request for members to contribute to various missionary funds to help support the growing proselytizing force and urged continued donations. "I thank you for your generous contributions," he said. "The need for help is ongoing, that we might continue to assist those whose desire to serve is great but who do not, by themselves, have the means to do so." Mormon men now can serve missions at age 18 (down from 19) and women at age 19 (down from 21). Other speakers Saturday took up timely topics such as the role of women and how to cope with mental illness as well as perennial subjects like the need for missionary work and the importance of scripture reading. In the afternoon, LDS apostle Jeffrey R. Holland tackled a difficult issue: "major depressive disorder," commonly called depression. "I am not speaking of bad hair days, tax deadlines or other discouraging moments we all have," Holland said. "I am speaking of something more serious, of an affliction so severe that it significantly restricts a person&apos;s ability to function fully, a crater in the mind so deep that no one can responsibly suggest it would surely go away if those victims would just square their shoulders and think more positively." The apostle acknowledged that he suffered from depression himself as a young father. "When financial fears collided with staggering fatigue, I took a psychic blow that was as unanticipated as it was real," Holland said. "With the grace of God and the love of my family, I kept functioning and kept working, but even after all these years, I continue to feel a deep sympathy for others more chronically or more deeply afflicted with such gloom than I was." He mentioned Abraham Lincoln, Winston Churchill and the eighth LDS Church president, George Albert Smith, who suffered from recurring depression for years as an apostle. Holland encouraged members with depression to get professional help.
" ... If you had appendicitis, God would expect you to seek a priesthood blessing and get the best medical care available. So, too, with emotional disorders," he said. "Our Father in Heaven expects us to use all of the marvelous gifts he has provided in this glorious dispensation." Those suffering should not consider suicide, Holland pleaded. "Whatever your struggle  mental or emotional or physical or otherwise  don&apos;t vote against the preciousness of life by ending it. ... Trust in God. Hold on to his love." The rest of us, he said, "can help by being merciful, nonjudgmental and kind." 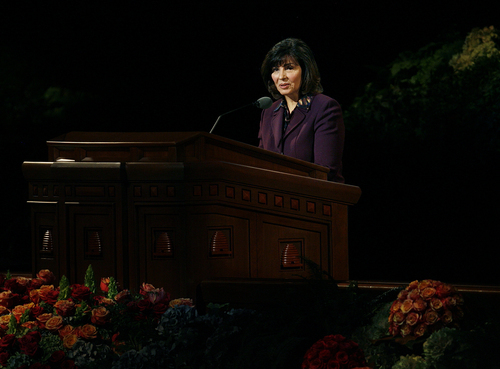 In a morning speech, Carole M. Stephens, first counselor in the Relief Society general presidency, said LDS men and women are equally endowed with God&apos;s power during Mormon temple ceremonies and both have a divine destiny. But, she added, they have "different gifts and different strengths." 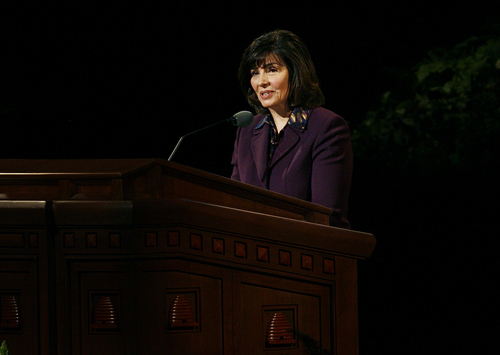 Men exercise the priesthood and receive the power and blessings of the priesthood, said Stephens, who became the second woman to pray in an LDS General Conference in April, while women "receive the power and blessings of the priesthood." Everyone, she emphasized, can receive spiritual promptings. "We all need each other," Stephens said. "Sons of God need daughters of God, and daughters of God need sons of God." Apostle D. Todd Christofferson praised women for having "innate moral authority" that is particularly powerful in the home and rearing the rising generation. "A mother," he said, "can exert an influence unequaled by any other person or in any other relationship." 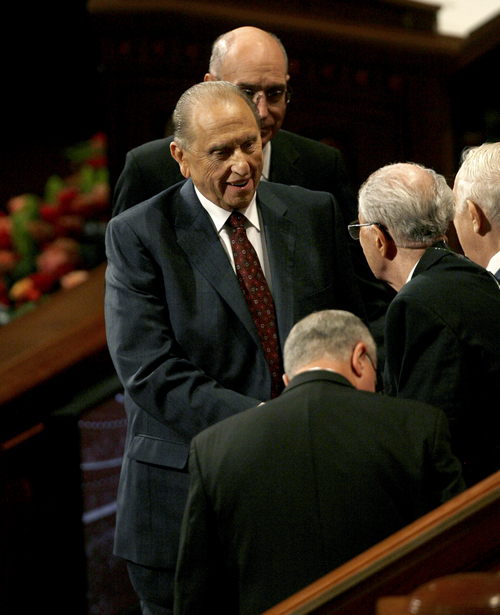 He warned his Mormon listeners about three "trends and forces at work" that would "weaken and even eliminate" that influence. Some feminist thinkers, Christofferson said, "view homemaking with outright contempt." Second, attitudes about human sexuality, including "abortion for personal or social convenience," and promiscuity, Christofferson said, "strik[e] at the heart of a woman&apos;s most sacred powers and destroys her moral authority." Third, Christofferson critiqued those who, "in the name of equality, want to erase all differences between the masculine and the feminine." "Often this takes the form of pushing women to adopt more masculine traits  be more aggressive, tough and confrontational," he said. "In blurring feminine and masculine differences, we lose the distinct, complementary gifts of men and women that together produce a greater whole." 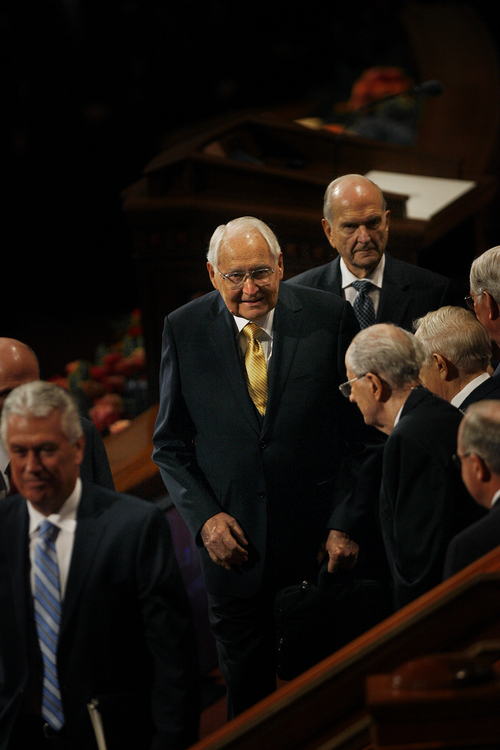 Boyd K. Packer, the 89-year-old senior apostle and next in line for the church presidency, spoke about repentance and the value of LDS sacred texts. 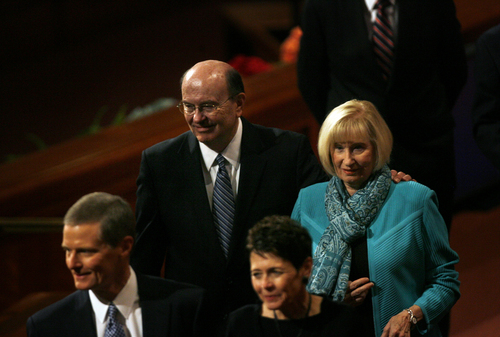 "The scriptures hold the keys to spiritual protection," said Packer, seated while speaking. "Children taught an understanding of the scriptures early in life will come to know the path they should walk and will be more inclined to remain on that path. Those who stray will have the ability to return and, with help, can find their way back." In his first conference address, Gifford Nielsen, former Brigham Young University quarterback, urged members to have a personal "game plan" to help Mormon missionaries in their area. "Since we are all on the Lord&apos;s team ... are we ready to play?" asked Nielsen, who was named to the LDS First Quorum of the Seventy in April. "We need to be engaged as never before to match the excitement of our leaders and the commitment of our full-time missionaries." In closing his sermon, Uchtdorf, dubbed by several Mormon commenters as "our Pope Francis," urged those who have left the LDS faith to come back, even with their doubts. "It&apos;s natural to have questions  the acorn of honest inquiry has often sprouted and matured into a great oak of understanding," he said. "There are few members of the church who, at one time or another, have not wrestled with serious or sensitive questions." Other may feel like misfits in the Mormon community. "If you could see into our hearts, you would probably find that you fit in better than you suppose," Uchtdorf said. "You might be surprised to find that we have yearnings and struggles and hopes similar to yours. Your background or upbringing may seem different from what you perceive in many Latter-day Saints, but that could be a blessing. ... We need your unique talents and perspectives." Regardless of one&apos;s circumstances, personal history or strength of faith, he said, "there is room for you in this church." Carol F. McConkie, first counselor in the Young Women&apos;s general presidency, offered the benediction Saturday afternoon, becoming the third woman to pray at LDS General Conference. The first two female conference prayers were given at the April gathering.